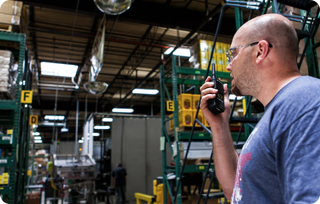 Gateway’s bar code and RFID capabilities are ideally suited for companies who are transitioning from a manual data collection process to an automated one, and need assistance in making cost-effective choices when purchasing asset identification, tracking and location access control solutions. We enjoy working in collaboration with our clients, acting to ensure their wellbeing. By putting client needs above our own, we deliver high levels of customer support and satisfaction. In short, we either deliver what we promise, or go to great lengths to make things right on those rare occasions when we don’t. Want proof? Just ask our clients – like NYU and Novartis. Gateway’s bar code and RFID solutions help healthcare organizations become more efficient and patient-focused, with accurate real-time information at the point of care, in labs or stockrooms and anywhere else you need secure data access. These solutions allow you to securely share information anywhere inside or outside of your facility. This leads to more attentive care, improved patient safety and improved efficiency. Contact us today and let us show you how our products and services can help you improve medicine administration, clinical documentation, bed management/patient flow, specimen tracking, charge capture and much more. We can construct state-of-the-art bar code and RFID solutions that include your entire healthcare spectrum. Inventory control, order picking & packing and shipping & receiving are all segments of this market that become more efficient when their processes are automated. The problems commonly faced with manual processes include increased labor costs, decreased accuracy, and limited ability to track inventory and assets. As technology has changed, so have the requirements for success. A mobile workforce and wireless connectivity are vital for many organizations for them to remain competitive in an increasingly tough economy. There are an estimated 1,100+ vivarium labs in the U.S., many of which are operating without automation to take a daily, weekly or monthly census. This can be very time consuming when thousands of cages need to be counted manually. Bar code and RFID technology can greatly reduce that commitment of time. By harnessing the power of RFID technology laboratory mangers can gain tighter control over important assets and the costs to maintain them.